Voters in Kevin Rudd’s former seat might be groaning at another bombardment, but the February 8 Griffith byelection has enough tactical importance for both sides to ensure this campaign won’t be a low-key affair. The Liberals would dearly love to bloody the nose of the as-yet- untested opposition leader by seizing the electorate, held by Labor since 1998. Bill Shorten needs the ALP to keep Griffith and indeed improve its vote, if he is to take advantage of Tony Abbott’s early problems and vindicate blocking the carbon tax’s repeal. The Liberals need a 3% swing to take the seat – very difficult after the 5.5% they secured in September. Rudd had a personal vote but Labor says its size varied in different parts of the electorate and it obviously took a knock as some people sent a message about the leadership in-fighting. For those missing the Rudd face and gestures, the 11-candidate field includes Rudd impersonator Anthony Ackroyd, running for the Bullet Train for Australia Party. Among the odds and sods, there is a candidate from the Katter’s Australian Party, but Clive Palmer’s PUP is staying out. Shorten was in Griffith today and will be campaigning there until Thursday. 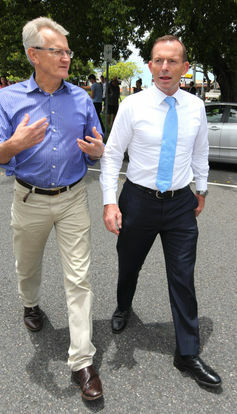 Abbott, attending the World Economic Forum in Davos this week, will hit the ground for his good mate Bill Glasson. Both sides say that, at this stage, the contest is tight. Labor has polled extensively and declares it is just ahead. Glasson says: “I think we are line ball”. The 61-year-old popular eye doctor is the best thing going for the Liberals. He wasn’t too keen to saddle up again after his marathon election run, but not to do so would have given the ALP an easy run. 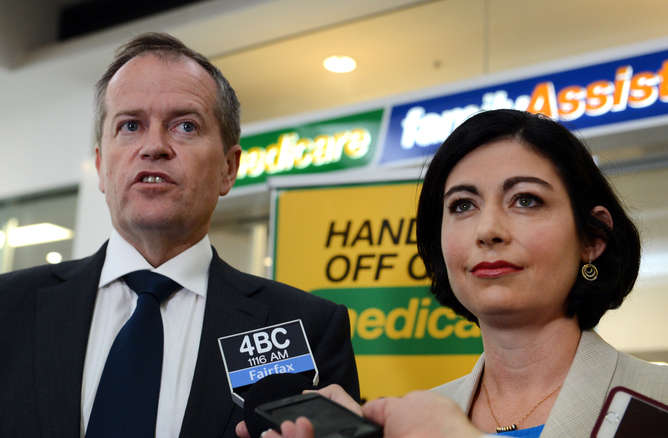 Labor’s Terri Butler, 36, also a local, is head of the employment and industrial law section of legal firm Maurice Blackburn in Queensland, but she has nothing like the profile of her opponent. Glasson’s pitch is that Griffith’s interest will be best served by a strong local member who, as part of the government, is a relevant voice. He’s also highlighting the carbon tax. With significant hospitals in the area, Labor is exploiting the state government’s health cuts, which Glasson describes as a reshuffling with very few lost jobs, and his support for a Medicare price signal for those who can afford it. It is raising the spectre of what the Feds might do after the Commission of Audit. Butler says: “People are not happy with the Abbott government and they are pretty unhappy with the state government”. Although the byelection comes at the term’s start and so its implications shouldn’t be exaggerated, the outcome could be significant for the mood in Canberra. A bad Liberal vote could make the government backbench jittery about tough measures. A big rebuff for Labor would hit that party’s morale. Griffith will be the first of several elections this year, all with direct or indirect federal implications. One is still a “maybe” election. The High Court will soon rule on whether there will be another West Australian Senate poll because of the lost ballot papers. The result wouldn’t change the basic fact of crossbench control of the Senate – which passes from the Greens to a gaggle of micro-players on July 1 – but the precise numbers would be up for grabs. If Labor and Greens between them got an extra seat out of a fresh WA poll, their potential to muster enough support to block legislation after July 1 would be marginally improved. The Liberals won three WA Senate seats at the election, while Labor scored two in the first count but only one in the second. 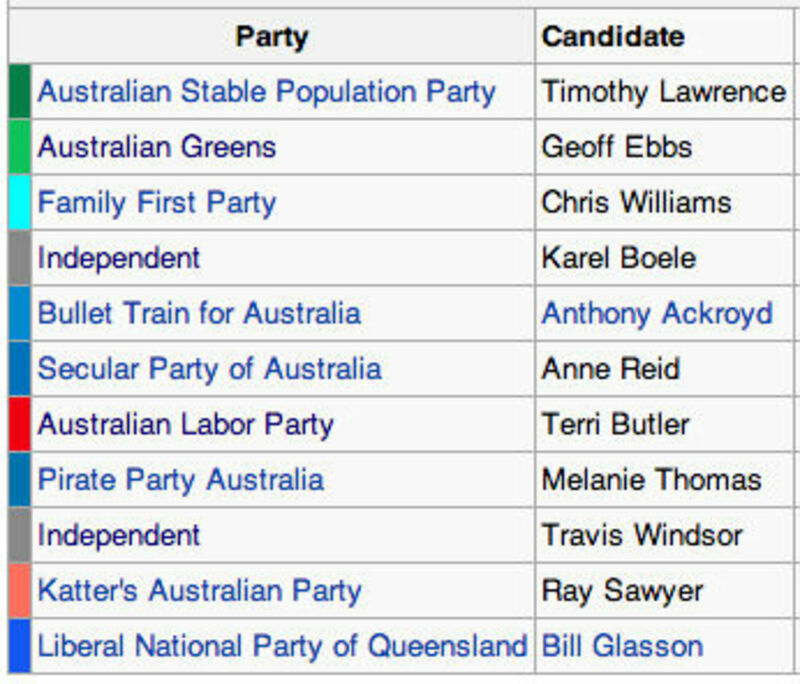 Palmer’s party got a spot only in the first count; in the recount, the Australian Sports Party was successful, as were the Greens. 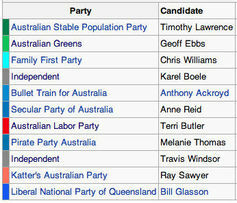 Clive Palmer says that in WA his Palmer United Party is polling between a quota and a half and two quotas. Before a WA poll (if it happens), there will be state elections in Tasmania and South Australia, both on March 15. In Tasmania, Labor is set for defeat. Much interest will be in what happens to the Greens and how PUP does. The Greens are in transition from having great power (federally and in Tasmania) to being the kids no one wants to know. Their federal vote fell; they’ll soon lose their Senate clout. A desperate Tasmanian premier has thrown them out of the state cabinet. A slump in what has been their heartland state would put tremendous pressure on the party, internally as well as externally. Palmer is making a big push in Tasmania; he believes PUP could get the balance of power – which would give it a fillip federally. But a challenge to its registration has raised doubt about whether its name can be got on the ballot paper in time (meaning its candidates would lose their distinctive labelling). Palmer dismisses the challenge and the problem. In South Australia, the debate about Holden has complicated the situation but the Liberal opposition remains in a strong position. Assuming Labor lost both states, there would be conservative governments everywhere except the ACT, although the ALP would have the opportunity of a comeback in Victoria later in the year. Blanket “blue” across the nation would in theory give the Abbott government no excuses in its push to reform federalism. But experience has shown that in this area, when it suits them friends can play hardball as readily as political opponents. This article was originally published at The Conversation and we thank them for permission to republish. Read the original article.